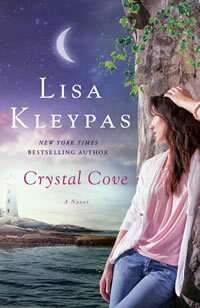 The people over at St. Martin’s Press have kindly offered us a copy of Lisa Kleypas’ upcoming Friday Harbor book, Crystal Cove, to give away among our readers. And to sweeten up the deal even more, the giveaway also includes an aphrodisiac essential oil (in case you want to get a massage while reading the book). For a chance to win, leave a comment telling me you’re in. If you don’t feel comfortable including your email on the comment, please come back on Friday to check if you won, because I won’t have a way to contact you. This giveaway is open to US and Canada residents only and it ends on Friday, February 1st. For more details check our Giveaway Policy. Lisa Kleypas is the Award-winning author of thirty-four novels and five novellas. Her books are published in twenty-five languages and are bestsellers all over the world. She lives in Washington State with her husband and two children. ONE WOMAN WHO HAS BEEN CURSED NEVER TO FIND LOVE . . .
ONE MAN WITHOUT A SOUL WHO WANTS HER MORE THAN LIFE ITSELF . . . THEY MEET IN A SMALL ISLAND TOWN IN THE PACIFIC NORTHWEST, WHERE MAGIC IS IN THE AIR AND FATE IS A FORCE TOO POWERFUL TO DEFY. . . . In New York Times bestselling author Lisa Kleypas's Crystal Cove, Justine Hoffman has made a comfortable life for herself on the island of Friday Harbor. She is the proprietor of a successful boutique hotel, and she has the safe, predictable life she has always wanted. Growing up with her flighty, nomadic mother, Marigold, has instilled in her a deep longing for stability. But in spite of everything Justine has achieved, there is still something missing. Love. And after years of waiting and dreaming, she is willing to do whatever it takes to change her destiny. And when Justine meets the mysterious Jason Black, she accidentally unleashes a storm of desire and danger that threaten everything she holds dear . . . because Jason has secrets of his own, and he wants more from her than fate will ever allow. St. Martin’s Griffin. February 5, 2011.
hey! I would love a copy because I just finally got Dream Lake. so, um...thanks for the giveaway. I haven't read this author yet and would love to win this book! I'm in the same boat as gonepecanla, lol! I just finished Dream Lake the other day. Thanks for the giveaway! The excerpt on Lisa's site was intriguing. I'm lookung forward to reading this book. I have the first 2 on my shelf; would love to have this one. Awesome awesome! I love Lisa Kleypas! Thank you and St. Martin's for the paperback! Love this series! Can't wait to check out this book! I really enjoyed the first book in the series so I'm looking forward to reading Crystal Cove. I do enjoy Lisa Kleypas' stories and would love to read this one. I have been LOVING this series and would love a chance to win! Can't wait to read this series! Love Lisa Kleypas! The book sounds good, would love to win. Thanks. Please count me in. I love this series and can't wait to read Crystal Cove. Thanks for the chance. I'm totally in! Love me some Lisa Kleypas! I'm in. Please enter me. Thanks for the giveaway. I would love to win Lisa's book. Pick me. I want this book. Love this seriesand love lisa's books. I have been wanting to read her books. Thanks for the chance! Like my friend up there, I also really want to win! I've read and enjoyed the Friday Harbor books by Kleypas ;) Thanks for the giveaway! I LOVE ALL of Lisa Kleypas's books. Can't wait for Crystal Cove to come out. Thanks for the giveaway! Sounds like a good story. I have the other 2.